You’d be surprised at the number of famous people in history who’ve visited Japan over the last 150 years — notable figures you might not think had ever been here. In our new monthly history series, Japan Yesterday, we’ll introduce when notable figures visited Japan for the first time and what they thought of the country. You’ll meet people like Ulysses S Grant, Helen Keller, Charlie Chaplin, Ralph Ellison and Babe Ruth among others. In the first article of the series, we start with Albert Einstein. From Nov 17 to Dec 29, 1922, Albert Einstein and his wife Elsa visited Japan. Their six-week trip, meticulously arranged and paid for by the Kaizosha Publishing House, made international headlines. Japan proved to be the most significant stop in the couple’s five-and-a-half-month tour that included stays in China, Singapore, Palestine and Spain. Far more than mere curiosity, Einstein’s trip was orchestrated more as a way of extracting himself from Berlin, where German nationalists had recently assassinated Jewish philosopher and diplomat Walther Rathenau. The brutality of Rathenau's death (killed while seated in his car on the street, then blown up by a hand grenade) "devastated" Einstein. He and his wife knew they were now on "a list" and needed to leave the country. Kaizosha was very interested in turning a visit by one of the world's most respected scientists into what one German ambassador called a "commercial enterprise." Besides providing translations of his books, Kaizosha agreed to pay Einstein £2,000 (around £110,000 in today’s currency) for what turned out to be 15 lectures, eight "scientific" and six "public," and one memorable "unplanned" talk to students at Kyoto University. According to "The Travel Diaries of Albert Einstein", edited by Cal Tech assistant director Ze'ev Rosenkranz and published just recently (May 2018), the trip was a massive undertaking for Einstein, and his personal thoughts reveal a man attempting to understand a culture very different than the one he was used to. His observations started while aboard the S.S. Kitano Maru, run by a predominantly Japanese crew. At heart a physicist, it's clear from his diaries that Einstein did not have a poet's sensibility when describing people from another culture. On the boat, he sees "Japanese women crawling about [on deck] with children. They look ornate and bewildered, almost as if schematic, stylized. Black-eyed, black-haired, large-headed, scurrying." Einstein also attempted to use deduction toward the nauseating agonies of boat travel: "I now think that seasickness is based on dizziness caused by lack of orientation, not directly on the apparent changes in gravity, according to direction and magnitude." 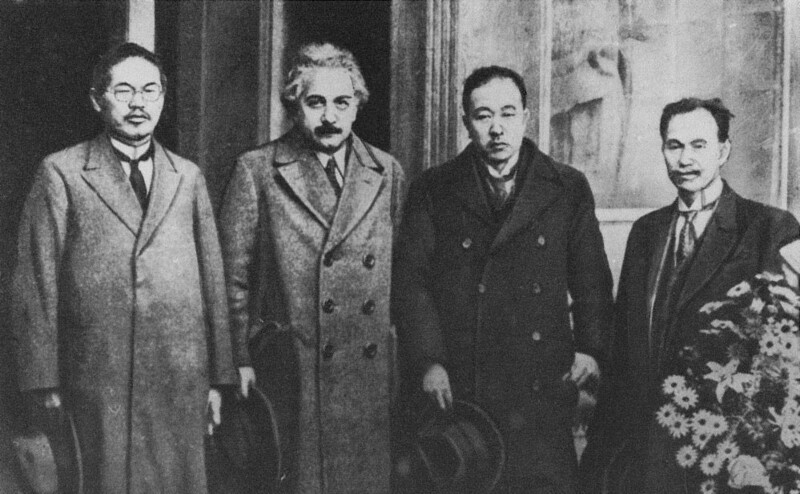 Once he arrived in Japan, Einstein was given a hero's welcome and at times the fame and obsessive attention overwhelmed him. One day into his tour, Einstein looked out a window just before the sun had risen. Below were thousands of Japanese people holding a vigil from outside his hotel. He could only shake his head and confide his thoughts to Elsa. "No living person deserves this kind of reception," he told her, as described by Einstein biographer Walter Isaacson in his book "Einstein: His Life and Universe" (2007). "I'm afraid we're swindlers. We'll end up in prison yet." With the exception of spending Christmas in Fukuoka, Einstein stayed on the island of Honshu, stopping in Kobe, Kyoto, Tokyo, Sendai, Nikko, Nagoya, Osaka, Nara and Hiroshima. His scientific lectures were carried out at the Physics Institute of Todai, or the Tokyo Imperial University. Four hours in length, most of the content proved challenging for many of the aspiring Japanese scientists who attended to comprehend — apparently as did most audiences around the world. The diary is a revelation into Einstein’s mind. Warts and all, the reader is able to absorb a humanized version of the man and understand the way he thought outside of physics. His gallows humor is evident, as well. On Christmas day in Fukuoka, Einstein used Hakata station to travel to a Moji YMCA in what is now Kitakyushu. At this point, he’d been photographed “10,000” times and felt lifeless. “I was dead, and my corpse rode back to Moji where it was dragged to a children’s Christmas and had to play violin.” Einstein’s corpse played “Ave Maria” before collapsing at 10 p.m. There was one stop, however, that seems haunting in hindsight. Depending on the forestry and angle of his view, Einstein could have glimpsed downtown Hiroshima and the Hiroshima Prefectural Industrial Promotion Hall — now known as the Hiroshima Peace Memorial, or the Genbaku (Atomic Bomb) Dome — built seven years earlier by architect Jan Letzel. Over 23 years later, on Aug 6, 1945, when the first atomic bomb used in history detonated above Hiroshima’s city center, the blast ripples would have been strong enough to break windows on the island he was then standing on. Patrick Parr is the author of "The Seminarian: Martin Luther King Jr. Comes of Age." His work has appeared in The Atlantic, Politico and The Boston Globe, among others. His rationale for arguing for the creation of the A bomb by the US was his fear that Nazis would develop it first, and use the bomb to enslave the world. In his letter to FDR, he never mentioned Japan as a reason for making the bomb. He must have been cracking some good jokes in the main picture, judging by the pile of zabuton he has accumulated! How strange that it was the Einstein atomic bomb.....I think it must have caused him pain when he saw what destruction it caused. If you go to Nara Hotel, where he stayed, you can see the piano he played in the lobby. Check it out! I always find that a tenuous connection. I think many scientists were aware of the potential energy of atoms even without that equation. If anyone can be classed as having triggered the search for an atomic weapon, it would be Enrico Fermi. Einstein's contribution was in writing a letter (or passing on someone else's letter) to the US government. I think his regrets were about that letter, not about his scientific theories.